Every year, Black Forest cake is the only cake that my husband, Yogesh request as his Birthday cake. This cake reminds him of the cake he used to eat back in Bangalore. It is very light, airy and can be very chocolaty delicious, if topped with chocolate shavings. First, I start out with a chocolate sponge cake from Joyofbaking.com, then, fill it up with some whipped cream and Morello cherries and top it up with more whip cream. I got my cherries from Trader Joe’s. I usually put a lot of chocolate shavings on top and side of the cake but this year, I wanted to try something new. I have always wanted to make a little forest decoration for this cake for a very long time now but couldn’t really think of what to use to make the forest trees. I was surfing around and found the technique of piping melted chocolate to create shapes and writing words. The three dimensional trees that I was planning to make didn’t exactly turn out well on the day of baking, and since I was short with time, I just piped some two dimensional trees that I found while surfing. 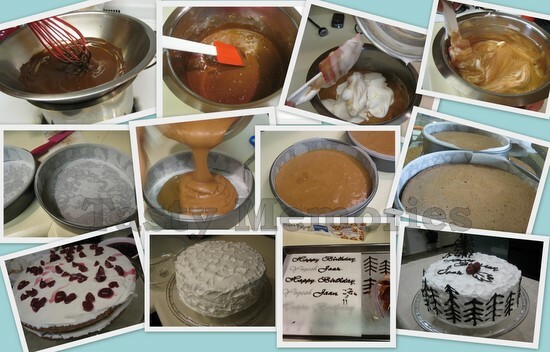 I usually make one batch, 2 layers cake but this year, I made two batches and created a 4 layer cake. Of course working in different batches is a little more time consuming but if you’re going to make it only once a year, it is worth every minute. Drain the cherries in a bowl, reserving the liquid. Cut the cherries in half or quarters and keep aside. Add the reserved liquid along with Kirsch and sugar in a small saucepan and bring to a boil on medium heat. Once boil, reduce heat to low and let simmer for about 10 to 15 minutes. The liquid will still be runny but it is ok since we will be brushing it on the sponge cake. Turn off the heat and pour this liquid over the cherries and let cool. While the eggs are still cold, separate the egg whites from egg yolks in two separate bowls. Cover loosely with plastic wrap and keep at room temperature for about 30 minutes. Meanwhile, cut 2 circles of parchment paper to fit the bottom of a 9” round cake pan. Cut 2 additional long strips to cover the sides of the pan. Take two 9” round cake pans and spray them with Pam or butter them. Line them with the precut parchment papers on bottom and sides of the pan. Spray with more Pam oil or butter them and dust with some flour. Set these aside. Place chopped chocolate in a stainless steel bowl and place this over a pot of simmering water. Stir continuously until the chocolate melts and keep this aside. With stand mixer or hand mixer, beat the egg yolks with 1/4 cup less 1 tablespoon sugar until light and fluffy, for about 5 minutes. Add vanilla extract and melted chocolate and beat to combine. Keep this aside. In a separate stainless steel bowl, with whisk attachment, beat the egg whites until foamy on medium low speed. Add cream of tartar and beat until soft peak forms on medium high speed. While continuing to beat, gradually add 2 tablespoon of sugar and beat until stiff peak forms. Take small amount of egg whites and fold it into the egg yolk mixture using a rubber spatula to lighten up the batter. Fold the remaining egg whites in two batches to the egg yolk mixture and fold just until incorporated. Do not over mix or the batter will deflate. Divide the batter equally into the prepared cake pans. Spread evenly with the spatula. Bake for about 15 to 18 minutes until the cake is puffed and lost its shine. Remove from oven and place it on a wire rack to cool. Loosely cover it with a clean damp paper towel. In a large bowl, with whisk attachment beat the heavy whipping cream and mascarpone cheese until soft peak forms. Gradually add powdered sugar and continue to beat just until stiff peak forms. Be careful not to overbeat the cream. Use the cream right away. Place a layer of cake on a platter. Brush it lightly with the liquid from the cherries. Use about 1 to 2 tablespoons of the liquid. Spread some whipped cream on the cake and sprinkle the cherries. Place another layer of the cake on top and brush lightly with the liquid from the cherries. Spread whipped cream on top and sides of the cake, to cover the whole cake. Decorate with some whole cherries and shaved dark chocolate or shapes made out of piped chocolate. This recipe is for 2 layer cake. For a four layer cake, double the recipe. To pipe chocolate, follow this method 1 for tempering chocolate. Place melted chocolate in a Ziploc bag, cut a small hole on one corner and pipe desired shapes on parchment paper. Chill in fridge for 10 to 15 minutes for chocolate to harden and is ready to use. OMG Keshu... looks soooooooo gooood!!!! !